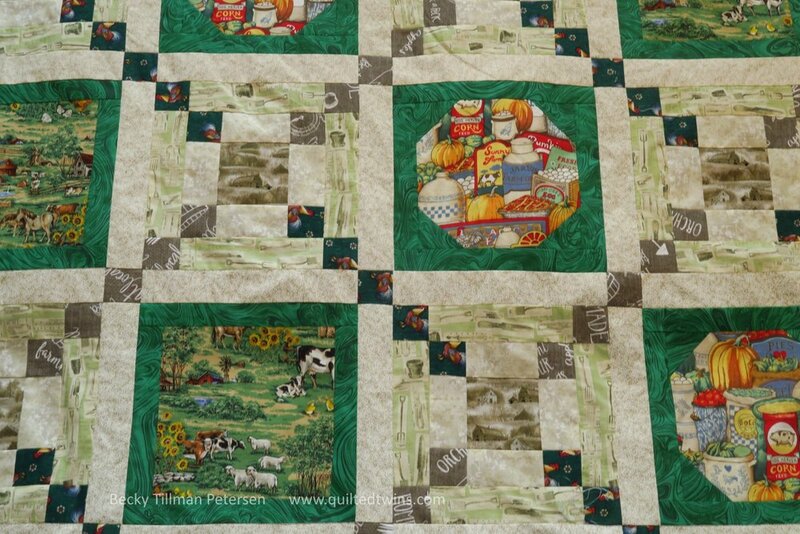 When I told my sis I would be willing to make a farm themed quilt for a door prize for next year’s Dade City’s Farm Bureau quilt dinner, this is what I had in mind. Well, to be honest, when I first volunteered, I didn’t have anything too much in mind. Then, when my sis went over to them and talked with them, they said that whatever it was, it had to be farm themed. I thought, “I can do that” - my sis has a whole shelf or two in her novelty area of farm themed fabrics - at least a couple dozen. So, before heading back to Poland, I went over and took a close look at what I wanted to make. I didn’t want to make this queen size quilt a John Deere farm quilt. What if someone doesn’t actually care that much for tractors? Who can know? I just wanted something warm and comfy and welcoming. AND it had to be simple. I wanted the farming part to be obvious. 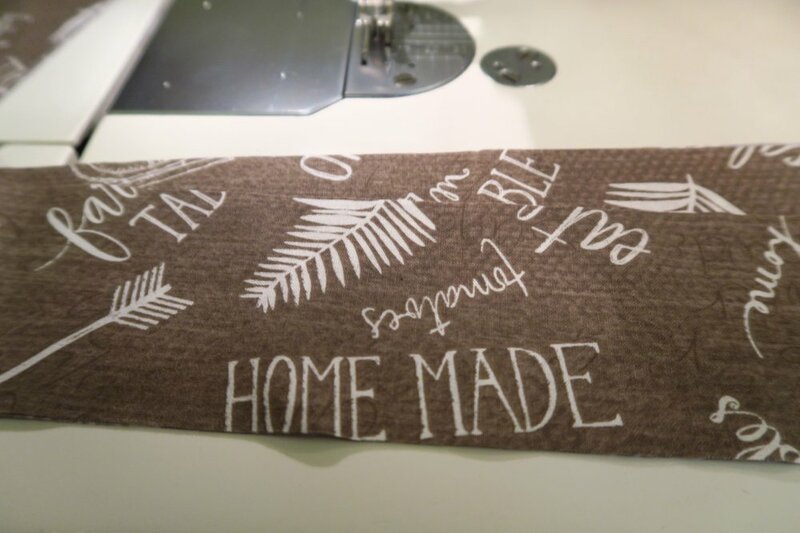 I didn’t want people to have to look at 2” squares and figure out that the fabrics were actually animals or farm words! So, it’s simple, farm-themed, and hopefully warm and cozy. Of course, since I wanted warm and cozy, I went with off white or slightly tan and not a pure white. That was my first decision. All the fabrics had to go with that. Then I decided on this down home fabric in the center of these snowballed blocks. That was the very first fabric I chose. Since I was choosing fabrics without a pattern in mind (since I wanted it to go into my suitcase) - I was kind of guessing what I wanted to do. I took all the rest of this fabric that my sis had at the time, unfortunately - I would have liked to have more! But I know that a lot of people aren’t quilters - people who don’t quilt or sew don’t really appreciate small pieces. In fact, I wanted the pieces to be big enough to see that they were actually farm themed. Thus, this pattern. I went with the chain just to help connect all those blocks together - plus I didn’t have enough of the feature fabric/s to not have that alternating block! It was kind of a must-have once I got back to Poland and designed something. This fabric I had in my own collection here in Poland. It was the perfect addition to the country supplies/farm goods I found in Florida. I really fell hard for this words fabric. Once I chose that first farm products fabric I found this one -and decided that I had to work it into the design, somehow. I brought back 2 yards of it! Then, because it seems like piano key borders add fun and warm to a lot of casual quilts - I thought it would be perfect for this one! So I added it. It meant that this particular quilt has a nice pillow tuck - it’s long. My sis said chickens are very popular fabrics for quilters. Who would have known? I surely didn’t have any idea! I added some fabrics from my stash to help round out the fabrics needed for the piano key border. 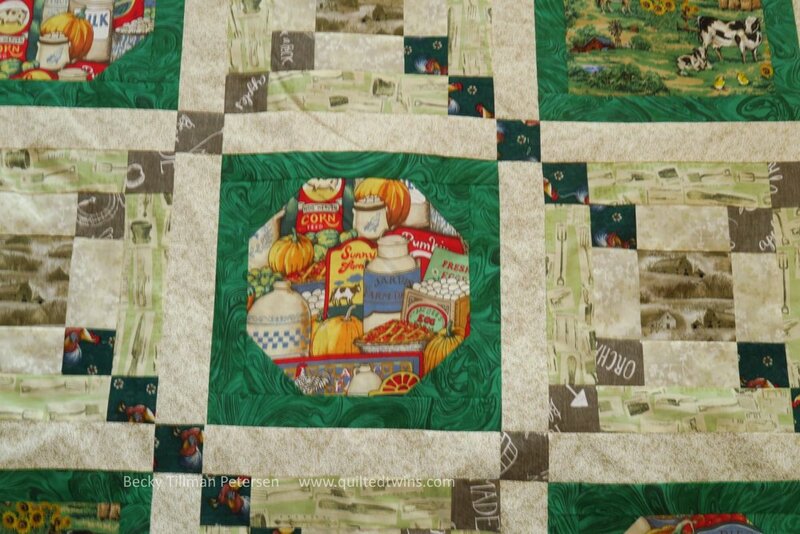 I had a couple of tiny John Deere pieces leftover from when I made my dad a John Deere quilt years ago, plus I threw in some sunflowers and bandanna. This center fabric - I really like it! 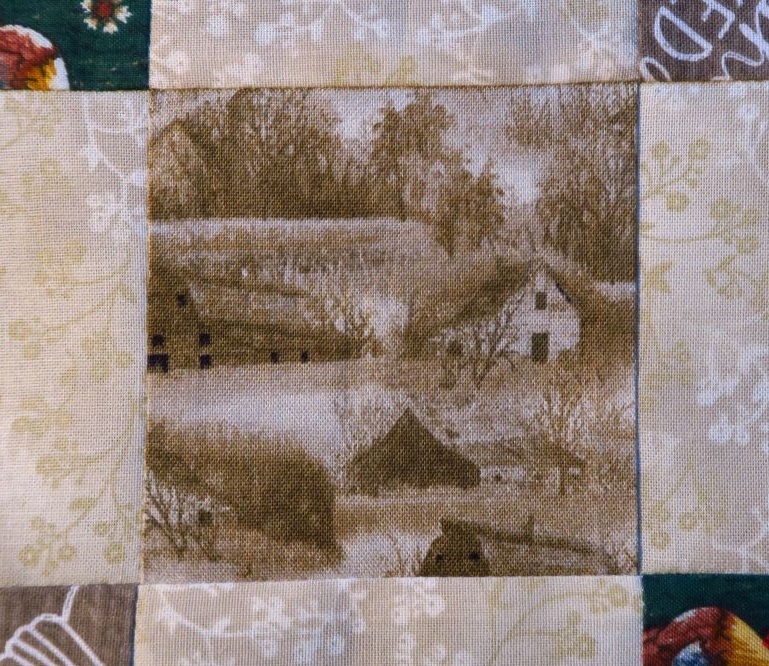 I could have done a four patch or even a nine patch in the center of the block, but I opted for this really nice farm print. It’s just old farm buildings, but went perfectly with the color scheme I was going for. I also made sure each square looked good. So, while I didn’t exactly “fussy cut”, I did watch out for it - trying to make sure each of these centers was a nice picture. I guess that means that I DID fussy cut, huh? The garden utensils fabric - I thought it was incredibly cute. I brought some back with me intending to somehow incorporate it into the quilt! It definitely reads as a “light” from a distance, so I used it instead of another cream/off white. So now you know…these are the fabrics I brought back and the top I came up with. Now I’ve got to finish it up and once finished and bound, I’ll take all the leftovers and make pillows/pillowcases and such for all three - trying to match them as best as I can. I am doing my best to make this quilt something universal - something that the average home owner in our town of Dade City, FL will like. I hope I’ve met the bill with this top’s design. The free pattern is here - called Country Links. Look towards the bottom of the page. Be sure to check out what my sis has for you over in the store! She is staying incredibly busy trying to keep you in fabric at prices you can afford.